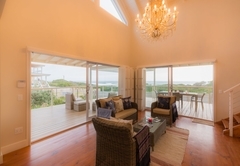 Kleinkrantz Beach House is a property providing self catering in Wilderness for up to 6 guests visiting the Garden Route region. 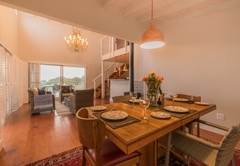 Kleinkrantz Beach House offers Garden Route accommodation in a charming and beautifully furnished villa situated across the road from Kleinkrantz beach in Wilderness. 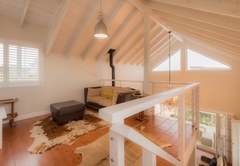 The house is tucked away in a quiet residential area of Kleinkrantz and is within easy reach Wilderness. 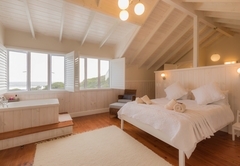 Kleinkrantz Beach House is a self catering holiday home that can sleep up to six guests in three sunny bedrooms, two of which have an en-suite bathroom. The main bedroom is furnished with a Queen-size bed. 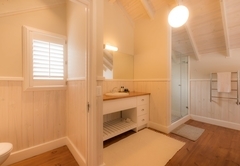 It has an open-air bathroom with a small bath and separate shower. The room leads to a TV lounge. 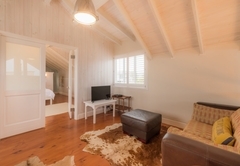 The second bedroom also has a Queen-size bed and an open air bathroom. It leads to a sea-facing deck. 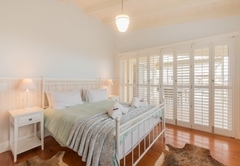 The third room has twin beds and opens onto a garden-facing private deck. 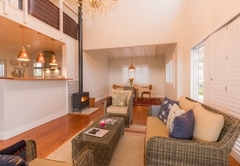 There is a spacious, open plan living area.The lounge is comfortably furnished and has a fireplace for the colder winter months. 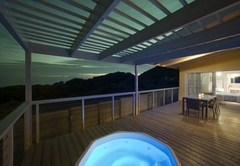 Sliding doors open onto a wrap-around deck with a Jacuzzi. 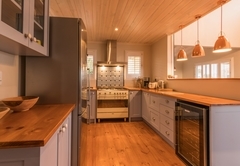 The dining table can seat six people and the kitchen is well equipped for self catering. 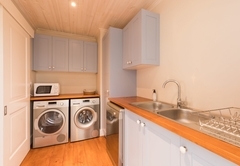 There is also a scullery with laundry facilities and a dishwasher. 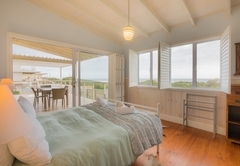 Kleinkrantz Beach House is a self catering holiday home that can sleep up to six guests in three sunny bedrooms, two of which have an en-suite bathroom. 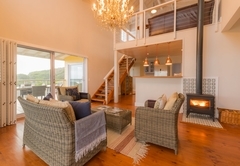 There is a spacious, open plan living area.The lounge is comfortably furnished and has a fireplace for the colder winter months. 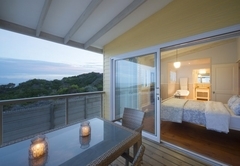 Sliding doors open onto a wrap-around deck with a Jacuzzi. 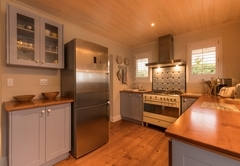 The dining table can seat six people and the kitchen is well equipped for self catering. If you arrive after 18h00 you will be subject to a late fee.